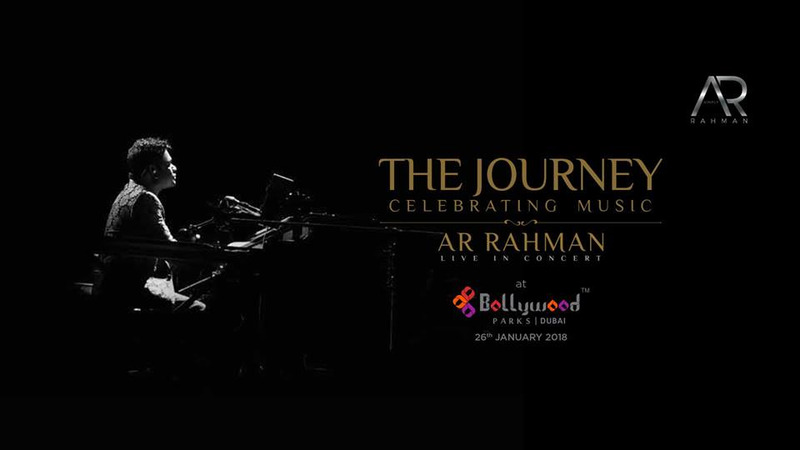 The Journey - Celebrating Music is a musical ensemble curated by Oscar & Grammy awards winner AR Rahman featuring over 20 performers across vocalists & musicians primarily from India and various parts of the world. The entire concert spanning 150 minutes shall be led by AR Rahman himself, of which he shall perform for approximately 120 minutes. AR Rahman completes 25 years in the global music industry and this performance, as suggested by its name, is a Celebration of his contribution to the world of music. For the first-time-ever, AR Rahman would be featuring a specially curated Hindi show in the UAE boasting a custom-designed set, stage and production just for Dubai. This AR Rahman concert is FULLY SEATED and shall include a spectacular stage production with spellbinding visuals on larger than life LED screens enhanced by automated moving stage elements, hydraulic lifts, smoke and pyrotechnics, digitally programmed intelligent lighting fixtures, all synced to a truly well balanced professional audio system controlled by state of the art digital audio mixing consoles. AR Rahman has composed for several International musicals like ‘Phantom of the Opera’, ‘Bombay Dreams’, 'Jesus Christ Superstar’; and Hollywood films like ’The Lord of War’, ‘Inside Man’, ‘Elizabeth - The Golden Age’, ‘127 Hours’, ’Slumdog Millionaire’, ‘Million Dollar Arm’, ‘The 100 Foot Journey’, ‘The Chinese Movie’, ‘Pele’, to name a few, he is popularly known as the man who redefined contemporary Indian music. According to the BBC, he has sold more than 150 million copies of his work comprising music from more than 100 film soundtracks & albums across over half a dozen languages. His extraordinary work for Slumdog Millionaire won 8 Grammy Awards including two for AR himself. Having created a super band, SuperHeavy, comprising Mick Jagger, Joss Stone, Damian Marley and Dave Stewart, AR Rahman has collaborated with several other musicians including Michael Jackson, Micheal Bolton, MIA, Dido, Akon, The Pussycat Dolls, Vanessa Mae, Sarah Brightman, Nusrat Fateh Ali Khan, Hossam Ramzy and Hans Zimmer.